Cop Block is a largely libertarian police accountability organization that was an initial supporter of the Peaceful Streets Project. From the beginning, many members of Cop Block (especially Pete Eyre) supported the Peaceful Streets Project. Their initial support was very helpful in allowing us to spread awareness of our efforts to take on police abuse, corruption, crime, and misconduct in Austin and in select other cities. However, in the past few years both the Peaceful Streets Project and Cop Block have changed in some pretty remarkable ways. 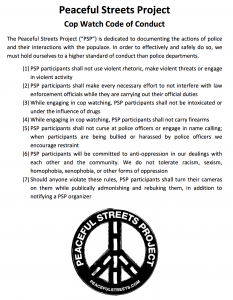 First, the Peaceful Streets Project was started with a vision of helping to bring about a society free of state-sponsored institutionalized violence. Never were we about making friends with the police, nor were we very concerned about non-state violence. Although some of the lead organizers wanted to, as an organization we deliberately shied away from many of the social factors that help feed aggressive and violent policing, as well as the social factors that helped feed violence in the streets. In particular, we avoided issues of race and gender. Our willingness to stand up to the police state while ignoring racism and misogyny allowed many unsavory people to rally around us. Many of those people; who were eager to focus on DUI checkpoints, marijuana laws, and SWAT raids; surprised us when they inexplicably but vigorously rallied behind white people who killed unarmed black people. This became most obvious in their rabid support of George Zimmerman who killed Trayvon Martin in 2012. By 2013, Antonio Buehler began to acknowledge more and more what co-founders Harold Gray, John Bush, and especially Kaja Tretjak had been concerned about when it came to non-state forms of oppression. Buehler used his position of relative influence to begin speaking out about issues of race and gender, and soon found that many of the followers of Peaceful Streets Project were attacking him. Many supporters encouraged him to disregard these issues in order to keep harmony among police accountability activists, but Buehler had come to recognize that opposition to only state oppression, and not the social oppression that helps fuel the ability of the state to harm people, was a fool’s errand. The police are a problem only to the extent that the structures and hierarchies in our society allow them to be. Things came to a head later in 2013 when Bush called out a homophobic facebook post, and then Buehler called out some racist and sexist facebook posts. This brought out vicious attacks from many who were at the intersection of some or all of the following groups: Cop Block, anarchocapitalists, Men’s Rights Movement, and Neoconfederates. One semi-popular libertarian blogger named Christopher Cantwell led the charge against the “White Knight,” “Social Justice Warriors” who dared to take offense at overt forms of bigotry. Soon, Buehler had hundreds of racist and sexist people attacking him for taking a stand against racism and sexism. Buehler responded by disassociating with everyone who was willing to associate with Cantwell, and this included Cop Block founder Ademo Freeman and many other members of Cop Block. Buehler was also forced to sever ties with people who had set up Peaceful Street Project facebook pages in various parts of the country. 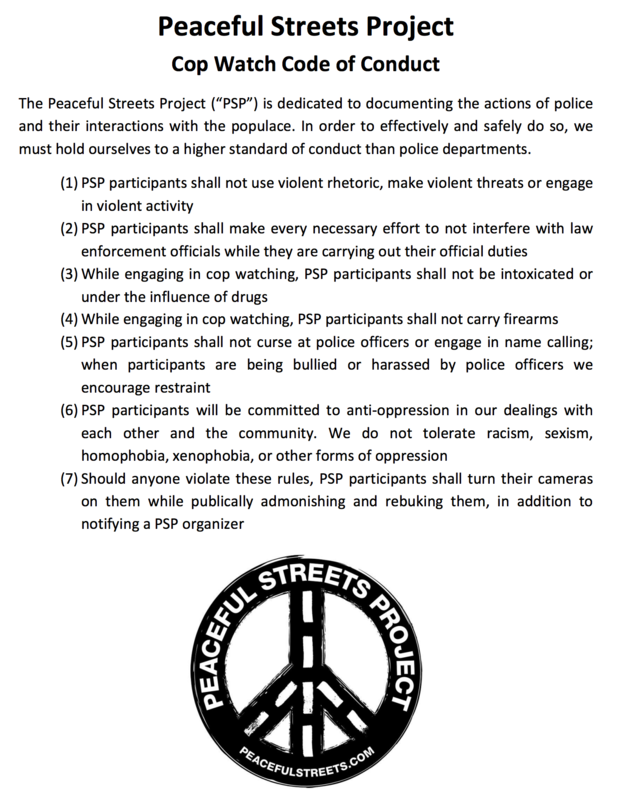 Since then, the Peaceful Streets Project has gone to great lengths to acknowledge how bigotry helps fuel oppression, and how we (as a largely white male group) can use our privilege to help undermine that oppression. We have sought out other groups that better reflect the populations being most abused by police (such as the Austin Justice Coalition) so that we can ally with them and support them in the struggle. Further, we are much more proactive in calling out bigoted behavior within our group, as we recognize that wonderful contributors had left the Peaceful Streets Project in the early years because it had previously been an unsafe space for them. Cop Block, however, seems to be going in the opposite direction. Instead of calling out bigotry in the ranks, they have tended to ignore it. While Cop Block claims that as a decentralized organization they cannot control the actions of their members, they do allow unilateral decisions if those decisions are made by the founder, Freeman. Further, while they claim they cannot do much of anything about the bigots in their ranks, as libertarians and anarchists they know very well the power of ostracism. Instead of ostracizing the bigots, they choose to embrace bigots such as Cantwell. And while they may try to claim that they don’t concern themselves with social oppression, and only state oppression, many members of Cop Block became silent when it came to the killings of Michael Brown and Freddie Gray, and they instead focused all of their outrage on people who rioted or looted in response to police executing unarmed people. 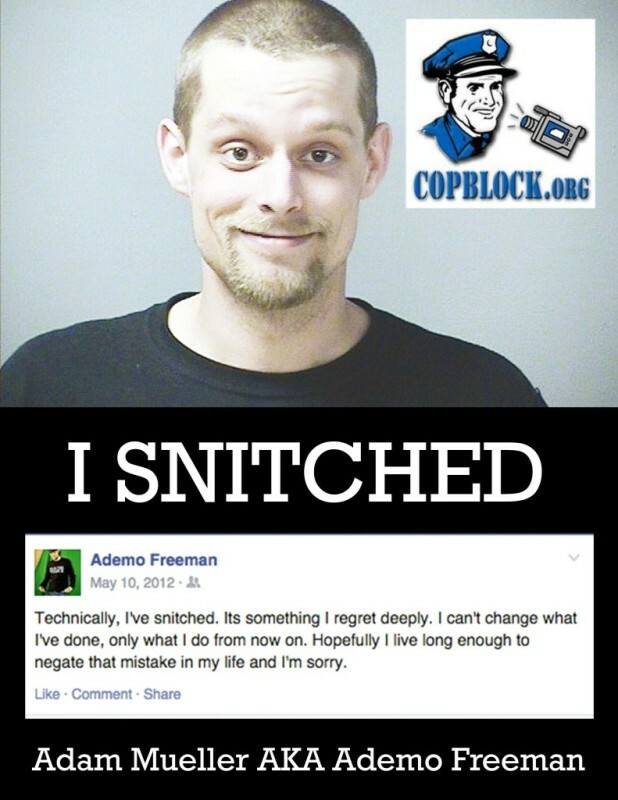 In recent days it has come to our attention that Ademo Freeman has gone completely off the rails. There is plenty of information circulating on the web about some extraordinarily disgusting behavior that has personally harmed individuals who did not seek to harm him, that we will not rehash here. WeCopwatch and Anti-Media, both of who were collaborating with Cop Block, have publicly distanced themselves from the organization. We commend them for doing so. Fighting the police state and holding police accountable cannot be done if we don’t hold each other accountable, first. We hope that other groups will do the same, and that the many decent people in Cop Block will push the bigots out of the organization. At Peaceful Streets Project we are less concerned about what happens on the internet than we are what happens in the street. We look forward to continuing to engage in direct action tactics that will help change the culture of society. We look forward to continuing to partner with organizations who want to end the police state – and who are willing to be smart enough to strike out against all forms of oppression that stand in the way. And yes, we also distance ourselves from Cop Block.